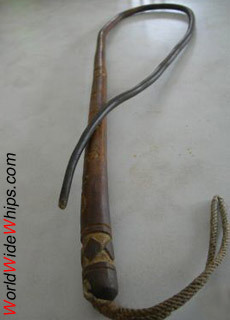 Very old sjambok with ornamental carvings on the handle plus a monogram reading "JRB". Overall condition is good, except a small part of the tip missing. The leather is very supple and shows signs of frequent use. Length without wrist loop: 3.5 ft, tapering from 22mm (7/8") down to 6mm (1/4").